Late last week, in this post, I mentioned that I'd either beat more of Dragon Quest IX's grottoes or tackle the game's final boss over the weekend. I ended up doing both. The latter task was accomplished after playing the game for just over 82 hours (yes, 82 hours), by the way. In that time, I won 2,142 battles and completed 29 quests. Oh, and I performed alchemy a whopping one time. What's next? Well, I conquer more grottoes and complete more quests, I guess. 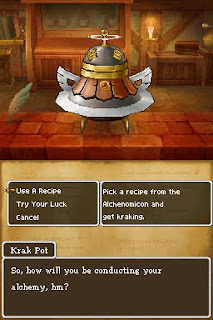 I probably should spend some quality time with the Krak Pot (right), too, don't you think? Wow...I just crested 1,000 fights. You're WAY ahead of me. How was the last boss fight? Hard? Well, the good news is that you definitely don't have to spend 80+ hours or win 2000+ battles to beat the final boss. I just spent a lot of time grinding and conquering grottoes before I tackled him. I haven't found any grottoes that were above level 14. I did beat Shogum, though. And I found another grotto that had Equinox as the boss. Hmmm, well, don't forget that you can conquer grottoes more than once -- and you get a new treasure map each time. That should help you get more maps -- and get higher level maps, too. Also, once you beat that level 14 grotto, you should get an even higher level one. BTW, I just beat a level 47 grotto -- the one with the Darkonium Slimes! I beat one of the Darkonium Slimes, too. Woo hoo! Oh, and beating the boss netted me a level 58 treasure map. Gulp! NICE! I'm still stuck in the low double digits...I was studying the charts n a DQ9 site, and it seems one or two of the dungeons I have maps to may net me higher maps. So...fun.